There isn’t much use of a free operating system if you cannot offer your customers all the basic features mobile users now take for granted. The Android mobile OS is free, but all the defining features of a mobile experience – app store, browser, email and maps – are all available under special, case-by-case agreements. Yandex.Maps, Yandex.Mail and our search service were the first to appear on the world's most popular Android platform, followed by the stellar user interface solution UI Shell 3D, which is now known as Yandex.Shell. 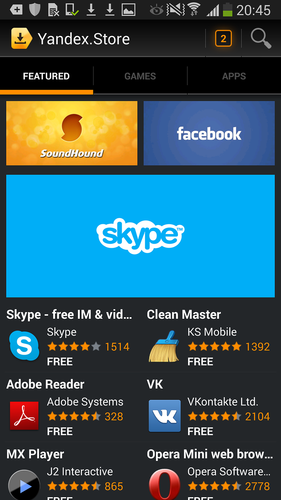 Last year, our application store for Android, Yandex.Store, Yandex.Browser and a cloud storage app, Yandex.Disk, joined the range of our Android solutions. While we primarily were working on covering all the bases for our users on Android devices, what we've got in the end was a full-fledged Android 'ecosystem'. A comprehensive, out-of-the-box solution, versatile and technologically honed enough to be offered to original device manufacturers as firmware that they can install on their devices shipped to the Russian market. This is the key to the car they were given for free and now they can drive it. 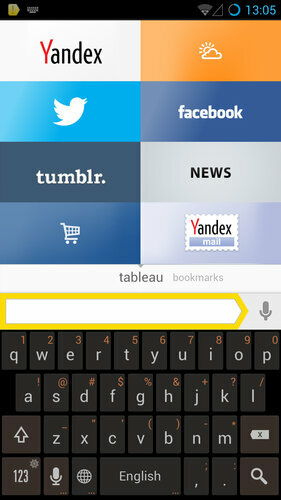 Yandex.Kit is a customisable suite of mobile components available for most versions of Android OS. It has all the basics indispensable for the up-to-date mobile experience. 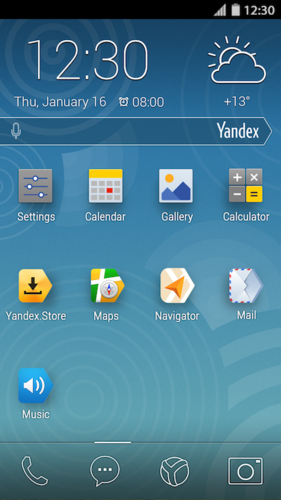 Vendors selling their original Android devices in Russia can enjoy the full Yandex.Kit package, which currently includes an app store, launcher and dialer, browser, maps, a cloud app - 15 apps overall. OEMs targeting other markets can enjoy Yandex.Kit as a trio of Yandex products – Yandex.Shell UI, Yandex.Browser and Yandex.Store. And the best part is there are no fees. Yandex.Kit is distributed on a fee-free basis and performs well on virtually any hardware, including the not-so-powerful devices popular in Russia and the CIS. In addition, smartphones carrying Yandex.Kit can be easily branded under the manufacturer's name. In Russia, the manufacturer can choose to market their device with the Yandex logo, to piggyback on the existing customer affinity for one of the most recognisable and strong brands in this country. Huawei and Explay, the early adopters of alternative Android software, will show their devices with Yandex.Kit on board at Mobile World Congress in Barcelona in just four days. Their phones will be available to customers in Russia in March. One-stop authorisation gives the user an opportunity to have access to all Yandex apps after entering their name and password only once – when they are setting up their phone. 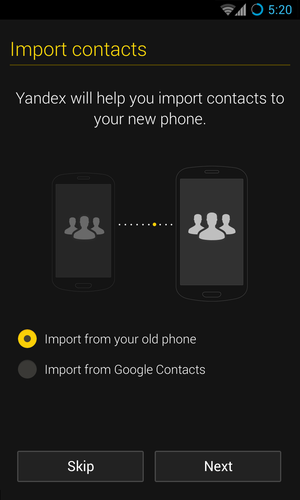 Instant contact syncing instantly imports the user’s contacts from their Google Account to their Yandex account. 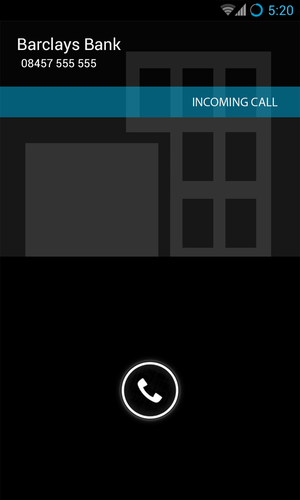 Smart dialer uses information from Yandex's Business Directory to identify the caller's number even if they aren’t one of the user's contacts. 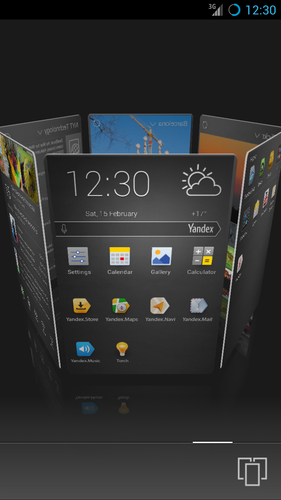 Yandex.Kit equips the Android device with a Yandex.Shell-based home screen, which transforms the device’s user interface into an interactive 3D space with useful panels and widgets. Advanced contact book finds the user’s contacts even when the search doesn’t exactly match the contact’s name, and offers phone numbers of venues, companies or businesses, such as restaurants, pharmacies or cinemas, in the vicinity of the user’s current location. 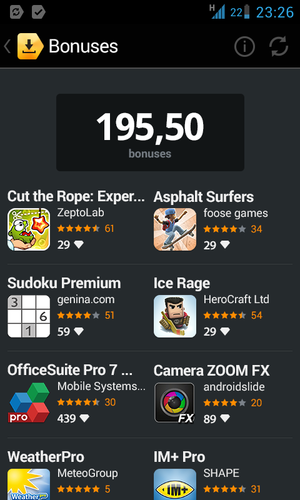 Android app store, Yandex.Store, gives the user access to the inventory of over 100,000 apps, including most popular, such as Twitter, Facebook, Skype, Cut The Rope and others. Users of Yandex.Store in the Yandex.Kit package also receive a 10% rebate from every app purchase to their 'rebate account', which can be used for purchasing more apps. The classical 70/30 revenue share scheme, when the revenue from app sales is shared between the app developer and the store, also includes the manufacturer or provider of the device that carries Yandex.Kit. Smart, secure and easy-to-use mobile browser, Yandex.Browser, offers smart search suggestions and saves the user’s favourite websites and tabs and arranges them into a single control panel. Yandex's cloud service, Yandex.Disk, is available for running on original devices as part of the package with Yandex.Store, Yandex.Browser and Yandex.Shell. 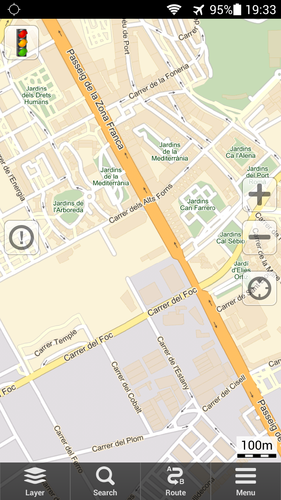 The map library, featuring a worldwide map and detailed maps for the largest US and European cities, compatible with any geolocation app via a mapping API, is available with Yandex.Store or as part of the full package. Android device manufacturers can also enjoy original branding opportunities for Yandex.Store and freedom to choose a search engine for Yandex.Browser on their mobile device equipped with Yandex.Kit. OEMs and mobile providers can discover more business opportunities at our stand E33, Hall 5 at Mobile World Congress in Fira Barcelona Gran Via, on February, 24-27.